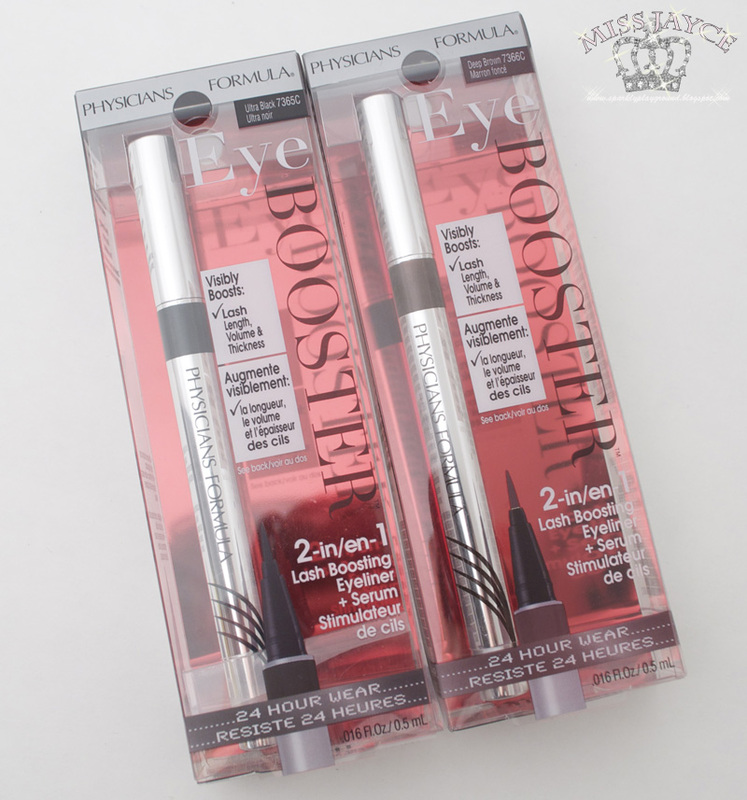 The back of the Physicians Formula Eye Booster 2-in-1 Lash Boosting Eyeliner + Serum. It shows diagrams and statistics of the results. However, please note that the before and after photos. The before photos don't have mascara while the after photo does. Feel free to click to enlarge. High-tech formula visibly enhances natural lash growth while providing the instant definition of a liquid eyeliner, in one easy step! Lash Boosting complex targets the root of lashes where it is most effective in providing nutrients associated with growing long, thick lashes. Innovative and easy to use eye-lining tool delivers effortless definition. The website's suggested retail price is $10.95 USD. Rexall retailed for $14.49CAD. 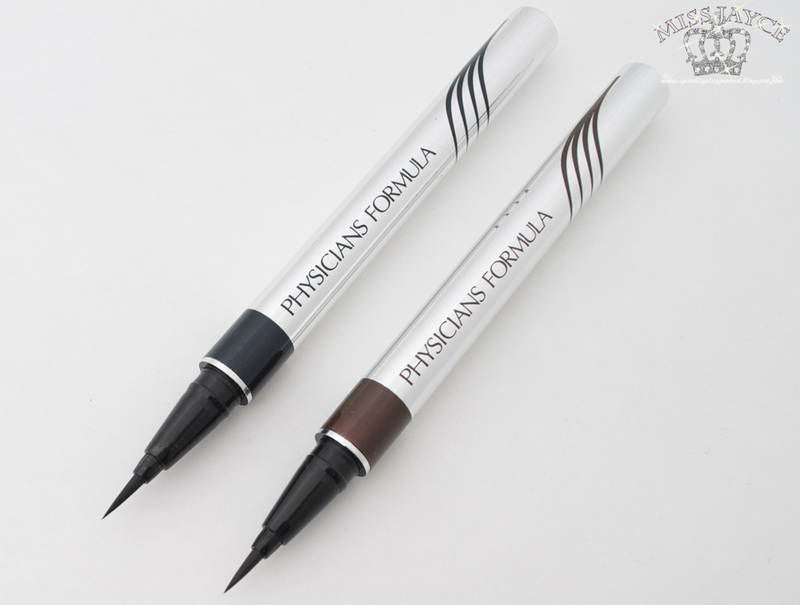 They are currently having a promotion which is 25% off Physicians Formula. I will update this part again once I get my rebate since I'm not sure whether they rebate the tax or not. First day, I first tested out the swatch of the liners. (see above left photo). I liked both colors. I am impressed with the brown, it's exactly what I had hoped for. I then tested the water-resistant feature (see above right photo). I moisten the back of my hand with a spray of water. Waved my hand around to natural dry a bit without rubbing. Then, with one swipe of my finger, to see whether color will come off. That was the result. It is certainly not waterproof however I do find that it is water-resistant. This is because, when the water was dripping from my hand, the liner did not smear, the color remained right where it was. It only smudged when my finger went through it and made contact with it. Thus, suppose it was raining, as long as you dont rub your eyes or make contact with the liner, it will stay where it is. I wore the brown eyeliner today, all day and napped with it on. The liner did not smudge even with my greasy lids. I'm pretty impressed thus far. =) Next update will be a week from now to see if there is any change to my eyelashes. 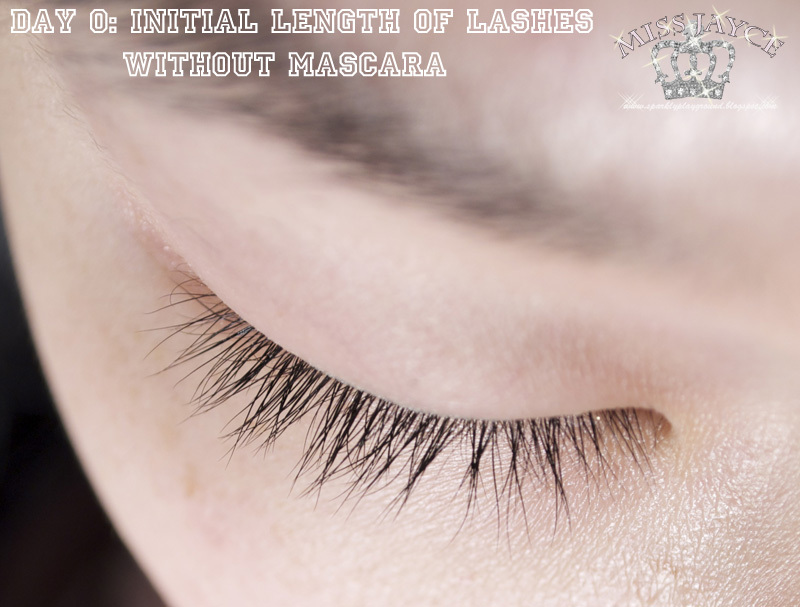 This is a photo of the length of my lashes without any mascara or primers. I suppose my lashes are about 90mm long. I look forward to seeing whether my lashes will be longer after all 4 weeks. Packaging: 5/5 ♥ Sleek and professional. I really liked that it's not pump or turn twist. Price: 5/5 ♥ It's basically free so I'm VERY happy! About $10 for a liquid eyeliner is affordable nonetheless. *I cannot fully rate it yet until the 4 weeks is up. Ever since I knew about the rebates program, I was hunting down this item because I was in desperate need of Liquid Eyeliners. Finally after several trips to Walmart, Shoppers Drug Mart and Rexall, I found it on Feb 4th at Rexall! I've posted some info about this on Twitter and my Luuux throughout this week. To see how the Eye Booster Display looks like, click here so you don't miss it in stores!